gives an array with m 0s of padding on every side. pads with m elements at the beginning and n elements at the end. pads with mi, ni elements at level i in array. The padding value "Fixed" indicates that the elements added at each corner should be copies of the elements at the corners of the original array. 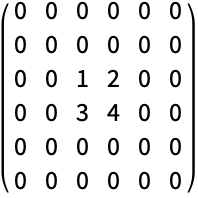 "Reversed" indicates that the outermost elements in the array should be repeated as the innermost elements in the padding. "Reflected" specifies that these elements should not be repeated. With the padding value "Extrapolated", the degree of polynomial used is specified by the option InterpolationOrder. ArrayPad pads full arrays of any depth. ArrayPad works with SparseArray objects. ArrayPad[array,-m] removes m elements from each side of array.